Red Sky North is a ‘hub on the lake’ situated on Lake Temagami, home to the Teme-Augama-Anishinaabe (People of the Deep Water) in northern Ontario. From 2006 – 2009, Artistic Director Sandra Laronde curated and produced three distinct Deep Water Music concerts. 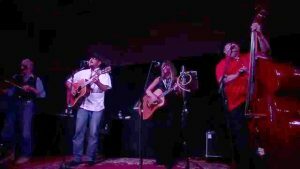 This concert series united home-grown and national musicians through music, culture, and the land of the Teme-Augama-Anishnaabe. Through these concert series, we developed innovative ways to facilitate creative exchange and nation-to-nation building with the Teme-Augama-Anishinaabe that go beyond the “gig mentality” and included vocal coaching for local performers, youth engagement, community voice intensives, and old-forest growth forest walks. Local and national artists included Shane Yellowbird, Murray Porter, George Leach, Wayne Lavallee, Shakti Hayes, David Laronde, Allan Laronde, the Deep Waters Band, Jamie Saville, the Eight Thunderbirds, Debbie Wynne, Wayne Miller Jr, Wayne and Ronda Potts, Randall Becker, and Micah Barnes (voice coach), among others. Through these three concerts, Artistic Director Sandra Laronde mentored the Temagami Artistic Collective in developing their own presenting capacity as a community presenter. Since then, this collective has significantly grown and have become a model for other northern Ontario communities to grow their own capacities. The TAC now curate and produce approximately 22 engagements annually in the Temagami area, and the music concerts have grown into a thriving Deep Water Music Festival as well as performance engagements year-round. 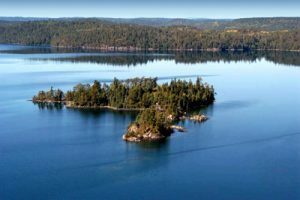 In 2008, Red Sky launched a new pilot project called the Deep Waters Project with the Temagami Artistic Collective to respond to the challenges of Temagami, Bear Island Reserve and the surrounding communities in northern Ontario. The two main objectives of Deep Waters: (1) the development of northern Aboriginal presenters, and (2) the sustainability of arts presentation within Aboriginal communities. The project includes mentoring and instruction for new presenters in First Nations communities north of Highway 17 in Ontario. Red Sky is focused on the pilot project below and works with a local community group, the Temagami Artistic Collective. The individuals who are strongly committed to the arts in their community will form an arts committee, Temagami Artistic Collective. This arts committee is responsible for arts presentation in the area. The schedule of workshops will be decided with the arts committee. Red Sky will conduct a cultural and community mapping workshop with the Temagami and Bear Island arts committee. The main objectives are to create a sense of community among the arts committee and to map out current resources and histories that will assist in arts planning. Once the community has mapped out its current resources, they will workshop their future visions for arts in their area. This visioning exercise will be limited to arts presentation. The committee will derive from this workshop concrete goals for future arts presentation. They will also be asked to connect the future goals to the current resources. After the committee has met a number of times on its own and designed plans for its arts presentation activities, the Red Sky consultant will run a workshop to refine and assist them in finalizing a plan. This stage in the development of local presenting must build self-determination in their plans and strategies. The committee will start to see itself as the central body responsible for sustainable arts presentation in their community. The Red Sky consultant will provide a workshop on grant writing and financial planning. The Red Sky consultant along with the committee will workshop the writing of the grants and funding proposals applicable to the proposed project. The workshop will also provide skills, knowledge and mentoring that the committee can carry into future projects. Red Sky will assist the committee in person, by phone, and by email in producing the arts presentation event or series. The committee will be driving the planning and production with secondary assistance from the consultant. We provide advice, tools and labour in the production phase of the Deep Waters. The Red Sky consultant and the Temagami Artistic Collective will meet to evaluate the entire process leading up to the arts presentation event and the event itself. The committee will undertake a self-evaluation and analysis. Qualitative and quantitative data will be gathered by the consultant in order to assist Temagami Artistic Collective and Red Sky in setting out performance measurements. First Nation communities in northern Ontario will receive increased Aboriginal cultural performances and arts related programming. First Nation communities will develop increased capacity to present events and programs in their own communities. First Nation youth will be exposed to Aboriginal arts and culture and will be offered opportunities to participate in learning programs in dance, theatre, music and storytelling. This participation may be of benefit on a recreational level, and/or may encourage greater interest in artistic expression by youth. Red Sky, and other artists and companies, will have more opportunities to perform in northern communities because there is a local presenter to host events and develop audiences. The Temagami Arts Collective (TAC) was founded in 2004 by Sandra Laronde and Vicky Blake in order to support Aboriginal artistic and cultural practice of the Teme-Augama-Anishnaabe (People of the Deep Water). The artists presented in the Deep Waters concert series to date include: Shane Yellowbird, George Leach, Murray Porter, Wayne Lavallee, Shakti Hayes, David Laronde, Allan Laronde, the Deep Waters Band, Jamie Saville, the Eight Thunderbirds, Debbie Wynne, Wayne Miller Jr, Wayne and Ronda Potts. The TAC has also programmed Red Sky's Raven Stole the Sun in Temagami in 2009. TAC is growing their presenting potential and has become a model for other communities in northern Ontario to grow their capacity within their respective communities. TAC now curates and produces approximately 22 engagements in the Temagami community annually.